After seven books (most recently all about Mead), a very successful annual music festival called Bourbon and Beyond, years as the Bourbon Authority for the Kentucky Derby Museum, and bylines in Whisky Magazine, The New York Times, and more, Fred Minnick is writing a new chapter. In January of this year, Kentucky’s Vintage Spirits Law took effect, which means that all of those dusties in your grandma’s basement and your neighbor’s attic now have a legal market for resale within the Commonwealth. “I started helping people find things. There are a handful of people who can look at a bottle and give the history behind it,” explains Minnick. It’s not always a matter of looking at a tax strip for the distilled and bottled dates. There’s the matter of determining whether there is counterfeiting or whether the contents could still be drinkable. Minnick is starting a venture he calls the Signature Series, which is basically a mashup of vintage whiskey brokering and curation of whiskey collections. He’s already had his first client, the Bardstown Bourbon Company’sBottle & Bond Kitchen and Bar. “The Bardstown Bourbon Company was very gracious about letting me kind of build whatever I wanted. 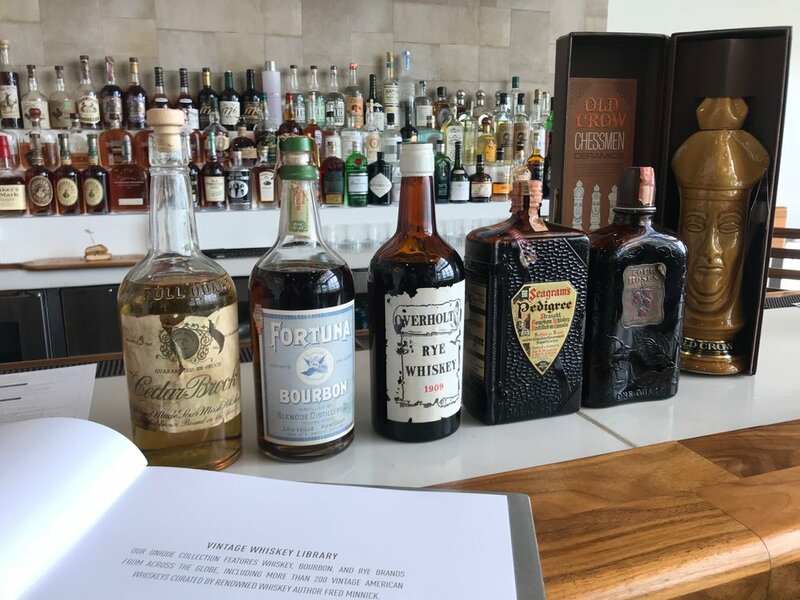 So I basically built my dream bar with someone else’ s money.” Included on the drinks menu are bottles from the late 1800s all the way through about ten years ago, in addition to wine, local beers, mocktails, craft cocktails, and more. “I think the hallmark bottle in there is from the 1890s. It’s from Cedarbrook, which was McBrayer in Lawrenceburg, Kentucky. It was one of those highly counterfeited popular brands that got a lot of love, especially in the Cincinnati area. It had a very specific region in which it was popular. That bottle has some really important heritage to Kentucky, but it also means a lot to Cincinnati,” says Minnick. This vintage whiskey curation service is going to make a positive impact on the tasting bars across the Commonwealth, opening yet another opportunity for tourists to experience bourbon history in an immersive way. Just don’t expect Minnick to work with you unless you care as deeply about bourbon history as he does. You can make reservations for Bottle & Bond Kitchen and Bar on Open Table. Hours are Sun-Wed 11am-5pm and Thurs-Sat 11am-close.